Monarch Air Group provides private air charter in Norfolk, VA. Our clients benefit from top-notch service, unrelenting dedication to safety, wide selection of aircraft, and years of experience in chartering private jets. To obtain a free quote, please use our online quoting tool provided below, or call toll free 1-877-281-3051. Monarch Air Group provides private jet charter flights in and out of Norfolk, Virginia, USA. 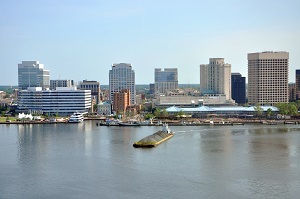 Norfolk is an industrial and naval port city in southeastern Virginia, on Hampton Roads. With a population of about 245,803 people, Norfolk is the 2nd largest city in Virginia. It is a home to several major performing arts companies as well as to numerous museums. Throughout the year, Norfolk hosts numerous festivals and parades. The most popular tourist attractions include Virginia Zoo, Norfolk Botanical Garden, Virginia Symphony, Chrysler Museum of Art, Naro Expanded Cinema, Nauticus National Maritime Center, Hermitage Museum and Gardens, Armed Forces Memorial, Virginia Stage Company at The Wells Theater, and much more. The city is served by Norfolk International Airport (ORF / KORF), which is located 10 miles from the city, and Newport News/Williamsburg International Airport (PHF / KPHF), which is located 30 miles from Norfolk. 9. MFV, Accomack County, Melfa, United States. 10. NGU, Nas Chambers, Norfolk, United States. 11. NTU, NAS, Oceana, United States. 12. ORF, Norfolk International Airport, Norfolk, United States. 13. PHF, Newport News/williamsb, Newport News, United States. 1. Sheraton Norfolk Waterside Hotel, 777 Waterside Drive, Norfolk. 2. Crowne Plaza Hotel Norfolk, 700 Monticello Avenue, Norfolk. 3. Renaissance Portsmouth Hotel & Waterfront Conference Center, 425 Water Street, Portsmouth. 4. Tazewell Hotel Downtown, an Ascend Collection hotel, 245 Granby Street, Norfolk. 5. Sheraton Norfolk Waterside Hotel, 777 Waterside Drive, Norfolk. 6. Crowne Plaza Hotel Norfolk, 700 Monticello Avenue, Norfolk. 7. Renaissance Portsmouth Hotel & Waterfront Conference Center, 425 Water Street, Portsmouth.